Sorry I have not posted on the site in awhile but life has been really busy lately. 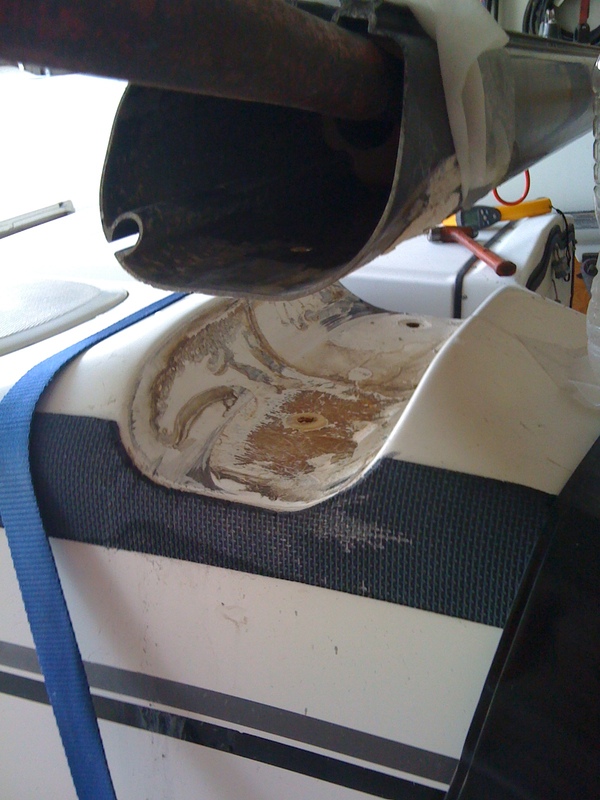 I have been working on my boat and hope to be back on the water real soon! The most time consuming thing was getting my beams loose from the death grip of 3M 5200 silicone adhesive. I found the fastest way to get them off and I figured why not share it in case one of you runs across it some day. 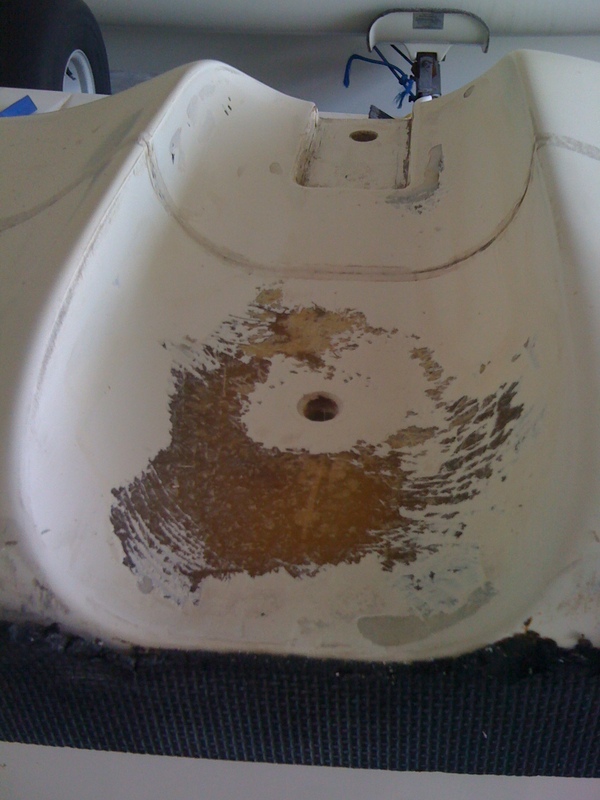 Warning using a torch or heat guns on fiberglass may cause major damage to your boat this was a last measure for me. Try other measures first if you decide to use this process you are doing it at your own risk. Breaking 5200 loose: We used a large metal pry bar inserted into the crossbar and a pulley mounted to the ceiling to pull up on it while we heated the inside of the crossbar with a acetylene plumbers torch (only one tank not a cutting torch) to about 400 degree’s at this point you can hear the 5200 start to crackle and smell it cooking. We still needed someone to sit on the hull and bounce to get the 5200 to come loose but it comes off fairly easy at this point. 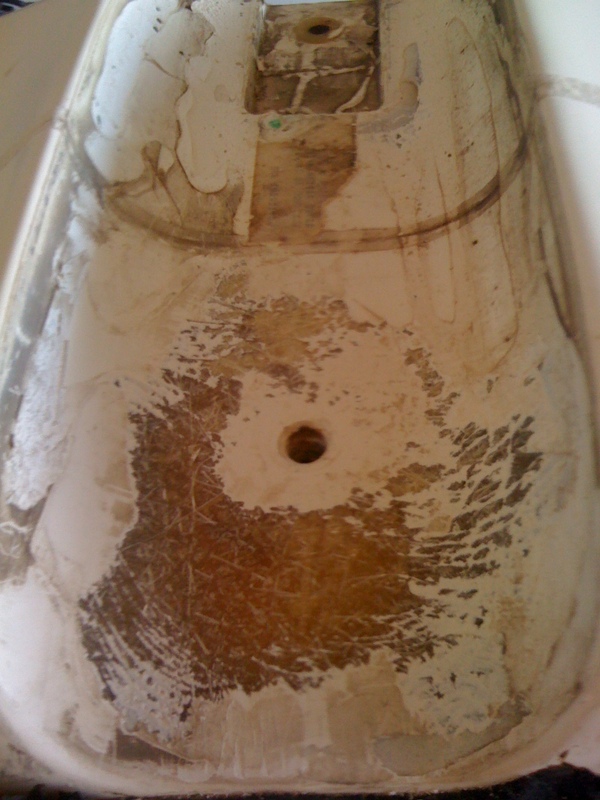 Aftermath: As you can see from the picture the 5200 came off but it also took some of the gel coat. The majority of the 5200 came off the hulls but was still bonded to the crossbar. Cleanup: I removed the left over 5200 from the hull by spraying it with Anti-Bond 2015 letting it sit for a few minutes then scraping it off with a razorblade. 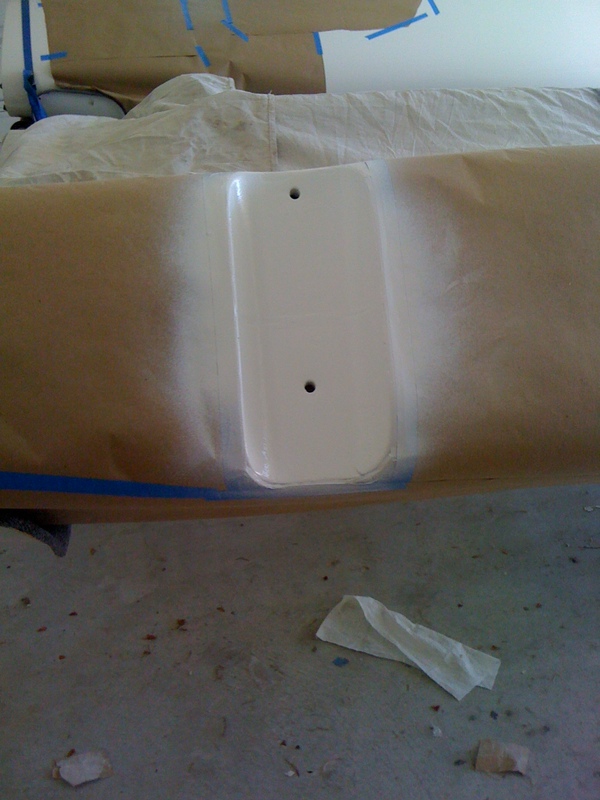 I then sanded the surface with 150 & 220 grit sandpaper to clean it up and level it out. Restore: I wiped everything down with acetone and masked it off. I used a cheap Preval sprayer to apply the gel coat. I thinned out the gel coat with acetone, to get a consistent spray I had to use almost a 1:1 mix. I got lucky the weather was mild enough that I was able to spray about 3oz of gel coat and take my time without the gel coat clogging up the sprayer. I used a tip from Chris Green and sprayed the gel coat with Pledge to seal off the repair so it would dry. The finished product looks pretty good it has a slight orange peel consistency it would clean up nice with a little wet sanding but it will be hidden under the beam so I don’t care. I did this to all 4 corners and now I am just waiting on my new tramp to come in from Slo sails before I mount them back on. ~ by Floyd on September 7, 2011.